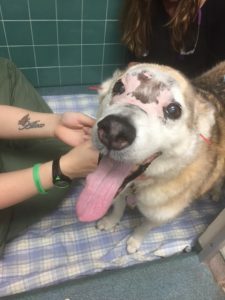 Abstract: Lucky was diagnosed with a sinonasal carcinoma in February 2017. 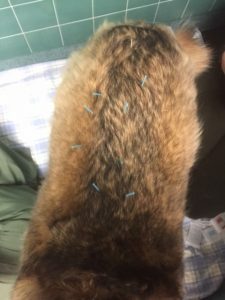 Acupuncture was started in May with the goals of improving his sinonasal symptoms and supporting his immune function while on anti-cancer therapy. He was anxious during treatments but tolerated them well. Physical Examination and Clinical Assessments: Alopecia of frontal/nasal area secondary to RT. Normal tear production. Occasional sneezing with blood. Neurology exam was normal: no deficits, no orthopedic disease found or reported in the history. He was also found to have significant myofascial pain along his T/L spine (more severe on the left). 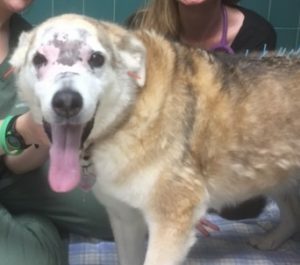 Medical Decision Making: My treatment goals were to focus on treating sinus issues/inflammation, to support Lucky’s immune system as his local immunity has been altered by radiation therapy. His ocular side effects resolved prior to starting acupuncture so this was not a primary focus. Differential Diagnoses: T/L myofascial discomfort- suspect local pain/nerve entrapment/tight fascia, no evidence of internal organ dysfunction on blood work, no evidence of orthopedic or neurologic disease, could be tense from persistent sneezing secondary to rhinitis. Definitive (or putative) Diagnosis (or Diagnoses): Sinonasal carcinoma, treated with definitive radiation therapy, on-going treatment with Palladia, mild rhinitis/sinusitis, T/L myofascial discomfort as above. 5/25/17- GV-14, GV-20, Bai-Hai, LU-1 bil, LI-10 and LI-11 bil, ST-36 bil, BL-10, 12-13 bil, BL-21, 23,25 bilat, local trigger point along L out bladder line (3 needles);, LI-4 R, KI-3/BL-60 bilat, PC-6 bilat, LR-3 bilat, SI-19 bilat. 5/31/17- sensitivity cranial thoracic with TP near BL 13-15 and BL 21-23. AP Treatment: GV-14, GV-20, Bai-Hui, LU-1 bil, LI-10 and LI-11 bil, ST-36 bil, BL-10, 12-15 bil, BL-21, 23,25 bilat, local trigger point along outer bladder line bilateral, KI-3/BL-60 bilat, BL-40, SI-19 bilat, GB-29,30/BL-54 bilat. Could not place distal limb points today. Outcomes, Discussions, and References: Lucky will now go to treatment every 2-3 weeks and continue on Palladia. Thus far, he has not required antibiotics for his rhinitis. Aside from alopecia he does not have any RT effects and has been tolerating his Palladia. His owner reports that he is “acting like a puppy again”. 1. Acupuncture for moderate to severe allergic rhinitis: A non-randomized controlled trial. Chin J Integr Med. Jul 2016. 2. Acupuncture for chemoradiation therapy-related dysphagia in head and neck cancer: a pilot randomized sham-controlled trial. Oncologists Dec 2016. 3. Effect of acupuncture in prevention and treatment of chemotherapy-induced nausea and vomiting in patients with advanced cancer: study protocol for a randomized controlled trial. Trials. Apr 2017.